What is a Predicted Log Race? Predicted Log races are similar to road rallies on the water. All you have to do is predict the time your boat will take to get from point to point on a designated course. You do the predictions in advance then run the course in your boat on the day of the regatta without clock or speedometer. An observer aboard, perhaps your spouse, records the time at each point, then afterward the actual times are compared with the predictions to determine the error. 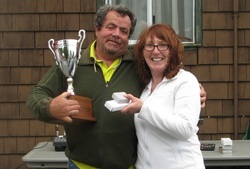 Trophies are awarded to the winners with the lowest errors at a fun social gathering following the regatta. You will gain a better understanding of your boat's performance and increase confidence in your own boating skills. And, a trophy or two to remind you what a great sport this is! Boaters of EVERY SKILL LEVEL AND BOAT LEVEL can participate! Predicted log skippers participate using every type of boat - from outboards to cruising yachts, and sailboats too. If the vessel is sea worthy and safe, and the participants are safe, the vessel is powered by a motor, you have a compass, a tachometer and a chart, then not only can you participate – but you can WIN!!! The "stories" you'll share while you wait for the scoring results will rival any fish tale you've heard. The folks you'll meet will share your love of the water and boats. This isn't just for skippers, bring your spouse and children so they can join in on the fun too! Skipper Kim successfully defended his 2012 Predicted Log win by convincingly finishing in first place again in 2013 with a total percent error of 96.88%. This is an outstanding result meaning that Kim really knows his vessel well.